Hamstring strain injuries are the most prevalent muscle injuries in track and field (TF). These injuries often cause prolonged symptoms and a high risk of re-injury. Strengthening of the hamstring muscles has been recommended for injury prevention. The authors review the possible role of eccentric training in TF hamstring injury prevention and introduce exercise classification criteria to guide clinicians in designing strengthening programmes adapted to TF. The principles exposed may serve as a foundation for future development and application of new eccentric programmes to decrease the high incidence of this type of injury in other sports. Muscle strains of the posterior thigh muscles (PTM), the ‘hamstrings’, present the highest index of prevalence1,–,12 and re-injury rates12 ,13 in sport and concretely in track and field (TF),1 ,3 ,12 ,13 as reported in many publications. An injury prevention approach for PTM would consider the interconnected, multidirectional and synergic interaction between various risk factors involved in this injury: core stability, range of motion, architecture, strength, fatigue and neuromuscular control.14 The value of this article for clinicians is its focus on strength factor in relation to hamstring strains. We review the possible role and effects of eccentric strength training for injury prevention and use that, together with injury biomechanics, as a basis to suggest an eccentric exercise classification criteria applicable to the TF athletes. One of the proposed risk factors for acute hamstring injuries in TF athletes is muscle weakness during concentric and/or eccentric contractions.21 ,22 Muscle weakness has been assessed with one of two methods: (1) comparing the peak torque values of the knee extensors (during concentric contraction) with their antagonistic muscle group that is the knee flexors (during concentric or eccentric contraction); and (2) comparing the peak torque values of one leg with the contralateral leg during knee flexion. Both methods have produced conflicting findings in prospective studies. Sugiura et al recently reported that eccentric peak torque (functional ratio and side to side) was significantly decreased in six sprinters who sustained an acute hamstring injury over a 12-month period.21 In contrast, Yeung et al found a decreased concentric H/Q ratio only at 180° with no eccentric deficits between eight injured sprinters and the remaining 36 sprinters in the cohort evaluated at preseason.22 Evidence is still weak due to lack and unpowered prospective studies and therefore, the influence of strength on the risk of hamstring injury in TF requires further investigation. Eccentric exercise may also prevent injury to the muscle-tendon unit by improving the muscle's ability to absorb more energy and increased force before failing.23 ,24 The exact mechanism of this adaptation is not defined, but is likely a result of both structural and neural influences. It is apparent, however, that, if the tissue failure force threshold increases and the attenuation of loads are enhanced, a protective effect can occur. Skeletal muscles have an optimum length for producing peak tension. Muscle strain injuries are thought to occur when activated muscles are lengthened to greater than optimal length.31,–,33 The hamstring muscles are actively lengthened during hip flexion and knee extension, which occur simultaneously during the late swing phase in running (ie, as the air borne leg swings forwards). Different authors suggest that, athletes who produce peak torque at shorter length are more prone to injury because part of the hamstring muscle is operating in a risk range of the length tension, as may occur during late swing phase of sprinting.31 ,32 ,34 A recent retrospective study has identified the optimum length as a risk factor for injury. Brockett et al measured the optimum lengths in some TF athletes with previously injured hamstrings.31 One leg served as the experimental leg (ie, previously injured hamstring), and the other leg served as the control leg (ie, uninjured hamstring). The previously injured hamstring produced peak tension at 12.7° less than the uninjured hamstring (ie, shorter optimum length). It has been argued that hamstring injuries can be reduced if this optimum length can be increased through training.31 ,32 ,34 The only form of training that has been shown to consistently increase the optimum length of tension development has been eccentric exercise.35,–,39 The addition of sarcomeres in series (sarcomerogenesis) related to a increased fascicle length and an increase in passive tension at longer length has been proposed to explain optimum length changes after eccentric exercise.30 ,34 Furthermore, eccentric training has consistently shown to be able to reduce hamstring injury rates.3 ,33 ,40,–,42 This may explain the success achieved by the Nordic hamstring exercise, the most common exercise used in literature to prevent such injuries. Thus, optimum length at a given strength may be an important variable for assessing injury risk and monitoring progression of an eccentric-based intervention. Brughelli and Cronin43 suggested a combination of uni- and bilateral exercises based on the principle of avoiding muscle strength asymmetry and possible overcompensations. This is a clinical recommendation – it has not yet been tested empirically. More recently, core stability concept has been strongly linked with hamstring injuries.44 Decreased neuromuscular control of the core as a possible cause of injury justifies the increased use of current trunk or core neuromuscular training as a central tenet of rehabilitation treatments and prevention.44 ,45 However, core stability use requires further investigation.14 Combination of multi-joint exercises in addition to only localised exercises will ensure core involvement during different exercises. As stated above, active lengthening of the hamstring muscles may occur both in the late swing phase (open kinetic chain) and during late stance phase (closed kinetic chain) of sprinting.15,–,18 ,20 This suggests that open and closed kinetic chain exercises should be included in the designed prevention programme. Furthermore, the hamstrings have a key role in the SSC.27 ,28 The hamstrings lengthen under load from 45% to 90% of the gait cycle (swing) absorbing imposed mechanical energy,15 and then shorten under load from late swing through stance to reuse this energy. In this way, they no longer act only as shock absorbers; rather, they perform more like springs.24 ,29 Therefore, we strongly advise to use SSC exercises and combine them with isolated eccentric exercises in open or closed kinetic chain in order to replicate hamstring function. A more detailed description of some exercises designed to cover the different injury mechanism suggested are shown in figures 1–4. Single leg deadlifts. Example of closed kinetic chain (fixed distal segment) single leg HIP dominant exercise. Hip ‘hinge’ and lumbopelvic neutral alignment and neuromuscular control is required. Slide leg curl. 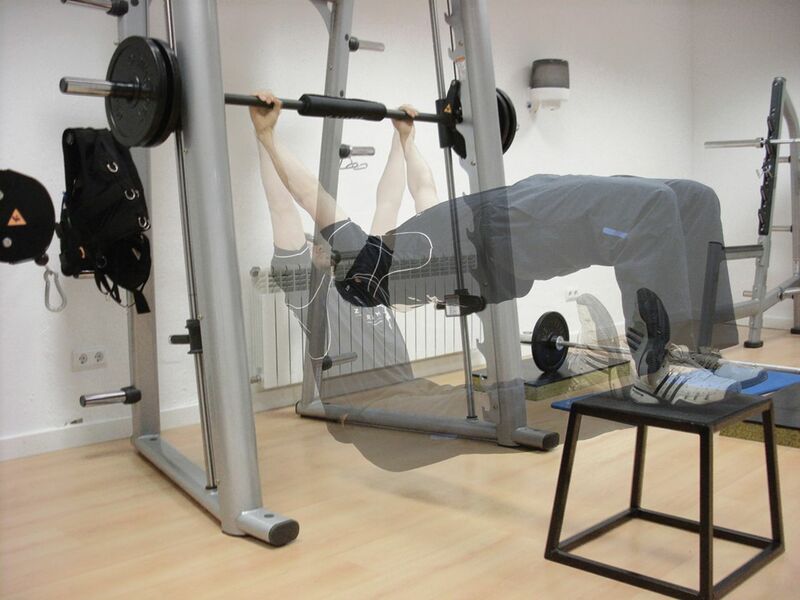 Example of combined hip and knee open kinetic chain (mobile distal segment) double leg exercise. Combined hip extension and knee flexion exercise. Eccentric knee flexion is done during descending phase and concentric knee flexion concomitantly with hip extension during the ascending phase. Hamstring catapult. Example of open kinetic chain, single leg HIP dominant exercise. Concentric hip extension is done during descending phase and eccentric hip extension to counteract hip flexion is done during recovering phase. Core muscle activation must be emphasised during the exercise. Sprinter eccentric leg curl. Example of open kinetic chain single leg knee dominant exercise. Concentric knee flexion during pulling and eccentric knee flexion to counteract cable imposed forces is done. Stability of the hip at the weight bearing leg and neuromuscular control of the core in order to counteract the torsional forces created at the trunk are required. When sprinting, the function of the hamstrings in the late swing phase is that of hip extension concentrically, acting to quickly swing the thigh backwards, while also acting as knee flexors to eccentrically decelerate the forward swing of the lower leg. Therefore, the hamstrings show a dual role for which they have to be prepared. Deficits in eccentric knee extension have been proposed as an injury predictor. Both Nordic hamstring and eccentric leg curl (yo-yo) exercise appeared as the most successful and safe choice to reverse this deficiency. However, during swing phase the moment arm and internal moments at the hip are double that at the knee,46 and the fascicle length of the hamstring muscles (biceps femoral – BF mainly) are more sensitive to hip position.47 ,48 Therefore, a comprehensive prevention programme may include both hip and knee roles of the hamstrings to reproduce their function during sprinting. A more detailed description of some of these examples are shown in figures 1 and 4–6. Nordic hamstring. Example of open kinetic chain bilateral knee dominant exercise. Hamstring muscles maximally contract against the knee-extending action as lowering throughout the range of motion while maintaining perfect neutral alignment between trunk and hip joints. Barbell leg curl. Example of closed kinetic chain (fixed distal segment) double leg HIP dominant exercise. Concentric knee flexion during ascending and eccentric knee flexion during descending is created with the only movement of hip. Barbell grip add posterior trunk muscle involvement. Exercise progression must proceed more in relation to length and strain parameters than to strength intensity and contraction velocity. Progressively increasing the length at which muscle groups are trained or modifying ground reaction forces moment arm in relation to the joint may also help to minimise initial muscle damage while gradually improving outer range muscle strength and protect against future injury risk. A more detailed description of how to progress from a simple lunge exercise in order to increase strain is shown in figure 7. Loaded lunge box drops. Example of progression in strain. Single leg closed kinetic chain hip dominant exercise. Drop jump from a height is done and therefore strain is achieved at the hamstrings due to increases in external hip flexion moments counteracted by internal hip extension moments eccentrically. Hamstring strain injuries are the most prevalent muscle injuries in track and field (TF). 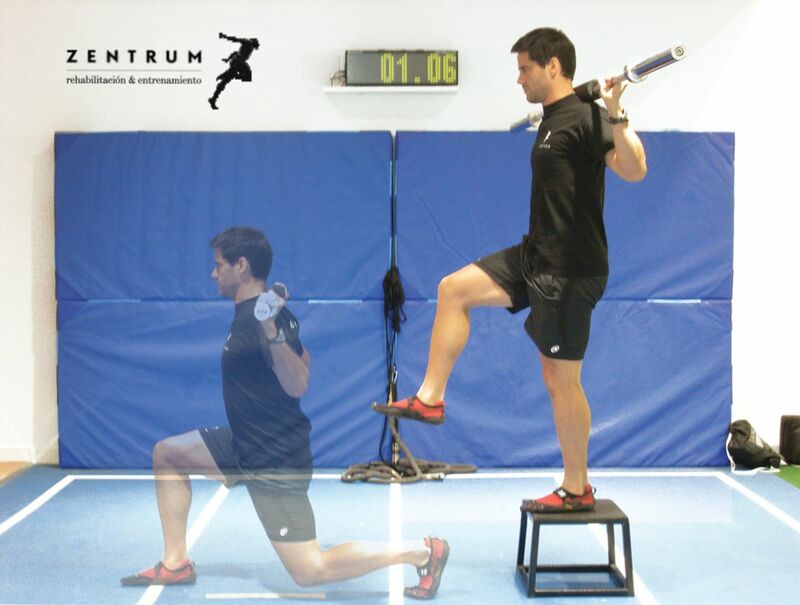 Eccentric training has consistently shown to be able to reduce hamstring injury rates. 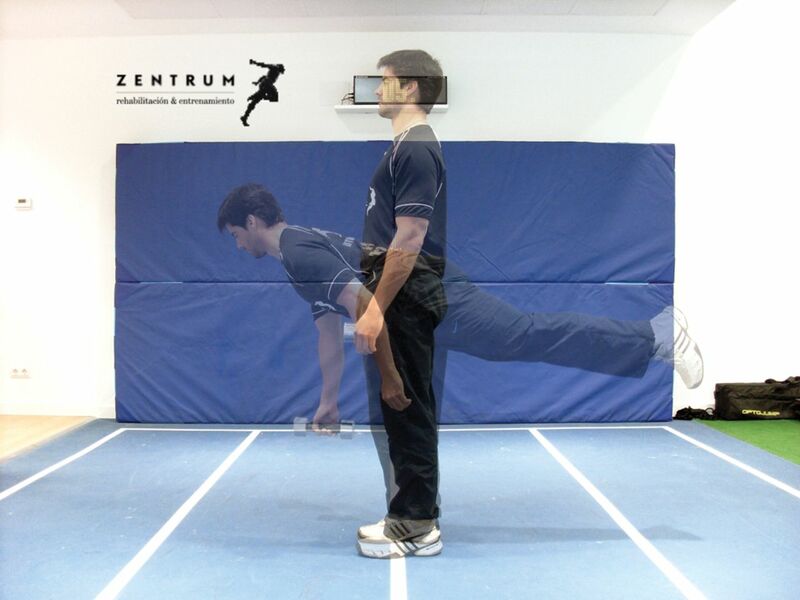 Establish principles and factors for analysis of any other sport in order to structure an eccentric intervention. In terms of fatigue, several studies have reported different energetic cost for eccentric contractions, with less metabolic demands in terms of oxygen consumption, ATP turnover or ammonia and lactate production compared with concentric exercise.64,–,66 However, given the important strength and neuromuscular impairments present immediately after eccentric exercise,67 ,68 we advocate the use of eccentric exercise at the end of training sessions. We recommend the use of highest intensities only with strength athletes already familiarised with this type of training. It would not be recommended to apply immediately an advanced programme of new exercises to an elite athlete without considering the adaptation process that the human body undergoes at new loads and new muscular spectrum performance. When planning the annual training calendar, consideration should be given to avoid high-intensity and long-length eccentric exercise during important competition phases, as the side effects of transient muscle soreness and strength deficits may impair performance. These training recommendations are derived from basic science and clinical experience and as we said above, randomised controlled trial studies comparing different eccentric exercise training programmes effects on hamstring injury prevention and on performance are needed in order to build solid knowledge in this area. Hamstring strain prevention should include specific muscle strengthening. Recent evidence suggests that the protocols of eccentric training can reduce hamstring injuries. To guide clinicians in designing effective and complete strengthening programmes, the basic effects and selection principles of eccentric training are exposed, using TF as an example. However, the same principles and factors can be analysed and applied when structuring an eccentric intervention for any other sport.
. Muscle strain injuries. Am J Sports Med 1996;24:S2–8.
. Rates and risks of injury during intercollegiate basketball. Am J Sports Med 2003;31:379–85.
. Factors associated with recurrent hamstring injuries. Sports Med 2004;34: 681–95.
. Epidemiology of injuries in English professional rugby union: part 1 match injuries. Br J Sports Med 2005;39:757–66.
. Epidemiology of injuries in English professional rugby union: part 2 training Injuries. Br J Sports Med 2005;39:767–75.
. Evidence based prevention of hamstring injuries in sport. Br J Sports Med 2005;39:319–23.
. Hamstring starin injury: are we heading in the right direction? Br J Sports Med 2012;46:81–5.
. Identifying the time of occurrence of a hamstring strain injury during treadmill running: a case study. Clin Biomech (Bristol, Avon) 2005;20:1072–8.
. Simulation of biceps femoris musculotendon mechanics during the swing phase of sprinting. Med Sci Sports Exerc 2005;37:1931–8.
. Biomechanical response to hamstring muscle strain injury. Gait Posture 2009;29:332–8.
. Amplitude and timing of electromyographic activity during sprinting. Scand J Med Sci Sports 1996;6:15–21.
. Hamstring muscle kinematics and activation during overground sprinting. J Biomech 2008;41:3121–6.
. Eccentric muscle contractions: their contribution to injury, prevention, rehabilitation, and sport. J Orthop Sports Phys Ther 2003;33:557–71.
. When active muscles lengthen: properties and consequences of eccentric contractions. News Physiol Sci 2001;16:256–61.
. Integrated electromyogram and oxygen uptake during positive and negative work. J Physiol (Lond) 1976;260:267–77.
. Metabolic reaction after concentric and eccentric endurance-exercise of the knee and ankle. Med Sci Sports Exerc 2001;33:791–5.
. Relationships between muscle power output using the stretch-shortening cycle and eccentric maximum strength. J Strength Cond Res 2008;22:1735–41.
. A threshold and continuum of injury during active stretch of rabbit skeletal muscle. Am J Sports Med 1995;23:65–73.
. Do muscles function as adaptable locomotor springs? J Exp Biol 2002;205:2211–16.
. Effects of eccentric strength training on biceps femoris muscle architecture and knee joint range of movement. Eur J Appl Physiol 2009;105:939–44.
. Altering the length-tension relationship with eccentric exercise: implications for performance and injury. Sports Med 2007;37:807–26.
. The effects of eccentric hamstring strength training on dynamic jumping performance and isokinetic strength parameters: a pilot study on the implications for the prevention of hamstring injuries. Phys Ther Sport 2005:6: 67–73.
. Progressive resistance training temporarily alters hamstring torque-angle relationship. Scand J Med Sci Sports 2007;17:18–24.
. Application of eccentric exercise on an Australian Rules football player with recurrent hamstring injuries. Phys Ther Sport 2009;10:75–80.
. Preventing hamstring injuries in sport. Strength Condit J 2008;1:55–64.
. Rehabilitation for hamstring injuries. Cochrane Database Syst Rev 2007;1:CD004575.
. Altered muscle activation following hamstring injuries. Br J Sports Med 2012;46:118–23.
. The biomechanics of running. Gait Posture 1998;7:77–95.
. Length and moment arm of human leg muscles as a function of knee and hip-joint angles. Eur J Appl Physiol Occup Physiol 1990;61:453–60.
. A method for determining lower extremity muscle-tendon lengths during flexion/extension movements. J Biomech 1990;23:487–94.
. Non-uniform changes in magnetic resonance measurements of the semitendinosus muscle following intensive eccentric exercise. Eur J Appl Physiol 2007;101:713–20.
. Non-uniform changes in MRI measurements of the thigh muscles following two hamstring strengthening exercises. J Strength Cond Res 2012;(In Press).
. Hamstring functions during hip-extension exercise assessed with electromyography and magnetic resonance imaging. Res Sports Med 2011;19:42–52.
. Muscle damage is not a function of muscle force but active muscle strain. J Appl Physiol 1993;74:520–6.
. Hamstring muscle forces prior to and immediately following an acute sprinting-related muscle strain injury. Gait Posture 2010;32:136–40.
. Effect of eccentric contraction velocity on muscle damage in repeated bouts of elbow flexor exercise. Appl Physiol Nutr Metab 2010;35:534–40.
. Designing resistance training programs. Third edition. Humankinetics, 2004:40–50.
. Greater initial adaptations to submaximal muscle lengthening than maximal shortening. J Appl Physiol 1996;81:1677–82.
. Effects of strength training with eccentric overload on muscle adaptation in male athletes. Eur J Appl Physiol 2010;108:821–36.
. Potent protective effect conferred by four bouts of low-intensity eccentric exercise. Med Sci Sports Exerc 2010;42:1004–12.
. A light load eccentric exercise confers protection against a subsequent bout of more demanding eccentric exercise. J Sci Med Sport 2008;11:291–8.
. Delayed onset muscle soreness: treatment strategies and performance factors. Sports Med 2003;33:145–64.
. Muscular adaptations to computer-guided strength training with eccentric overload. Acta Physiol Scand 2004;182:77–88.
. Importance of eccentric actions in performance adaptations to resistance training. Aviat Space Environ Med 1991;62:543–50.
. Efficiency of human skeletal muscle in vivo: comparison of isometric, concentric, and eccentric muscle action. J Appl Physiol 1997;83:867–74.
. Eccentric muscle damage: mechanisms of early reduction of force. Acta Physiol Scand 2001;171:311–19.
. Differential effects of exhaustive cycle ergometry on concentric and eccentric torque production. J Sci Med Sport 2001;4:301–9.
. Recent advances in the understanding of the repeated bout effect: the protective effect against muscle damage from a single bout of eccentric exercise. Scand J Med Sci Sports 2003;13:88–97.
. Muscle damage from eccentric exercise: mechanism, mechanical signs, adaptation and clinical applications. J Physiol (Lond) 2001;537:333–45.